I looked around at a lot of different taco sauce recipes and none of them seemed exactly right to me, so I kind of cobbled together my own according to what I had on hand. Very tasty! Store in fridge, cute jar label optional. This sounds really tasty!! I’ve got tacos on the menu, I can’t wait to try this sauce on them 🙂 Thanks for the great recipe! Sounds great. 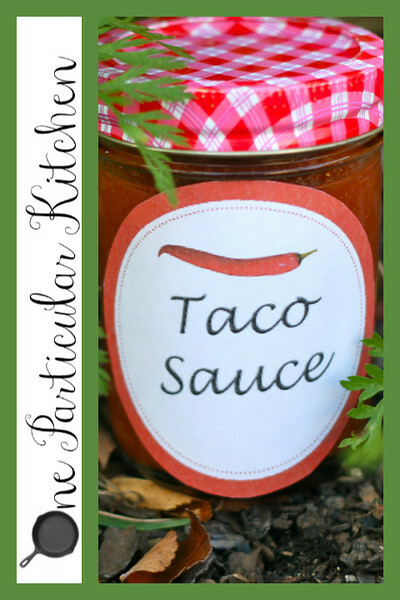 I’ve never made my own Taco Sauce, this sounds like it’d be great. What a great Christmas gift idea too! Wonderful. You inspired me to make my own! Can you freeze this product? Hello, the whole thing is going well here and ofcourse every one is sharing information, that’s genuinely fine, keep up writing.